"Here was a buzzing hornet, a wild thing, burning the air like raw spirit burns the throat”. 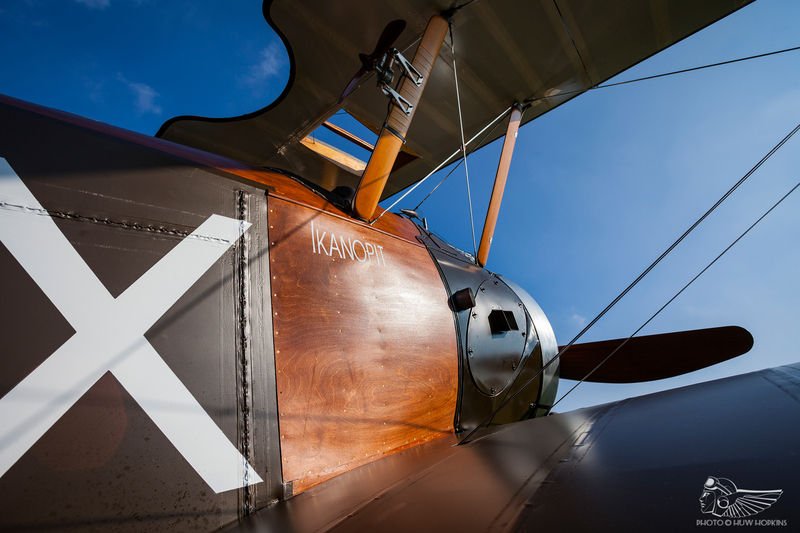 First, some background: In mid World War One the Sopwith Company produced their 1½ Strutter, a two seater with a forward firing synchronised gun. 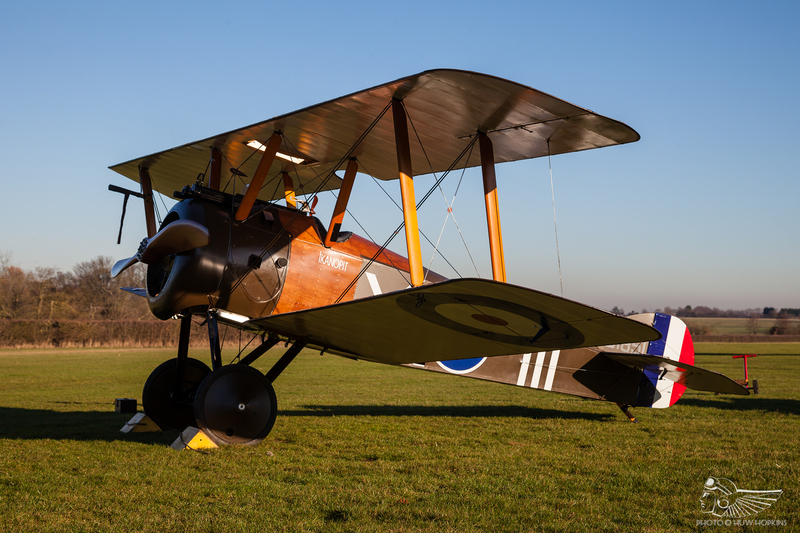 It entered operational service in the first half of 1916 and was a very effective multi-role aircraft for a time. It was powered by a 130 HP Clerget, had a wing span of 33’ 6”, a wing area of 346 square feet, with a loaded weight of 2,149 lb. This aircraft was longitudinally stable and was equipped with a trimmable tailplane; indeed some felt it was too stable for a dogfighter. Shortly afterwards Sopwiths produced the Pup which was powered by an 80 HP Le Rhone, had a wing span of 26’ 6”, wing area of 254 square feet, with a loaded weight of 1,225 lb. This aircraft was longitudinally unstable and had no trimming device (which would have been an unnecessary encumbrance in an unstable single seater). With its lower wing loading, lower power loading and its longitudinal instability the Pup turned out to be a much more agile machine than its predecessor and although outclassed by later German fighters it remained in front-line service until the end of 1917. In an attempt to make a better scout Sopwiths fielded their Triplane which was essentially a Pup fuselage fitted with three narrow-chord wings and a more powerful engine – a 130 HP Clerget. 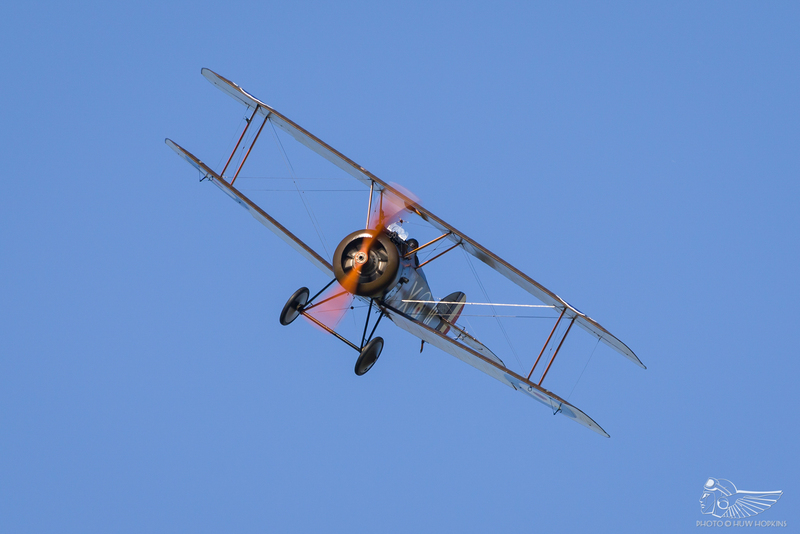 The Triplane had the same wing span as the Pup, a wing area of 231 square feet, and a loaded weight of 1,540 lb. Although the wing loading was somewhat higher the improved power loading gave better climb performance. Like the 1½ Strutter this aircraft was fitted with a trimmable tailplane and was about neutrally stable longitudinally. 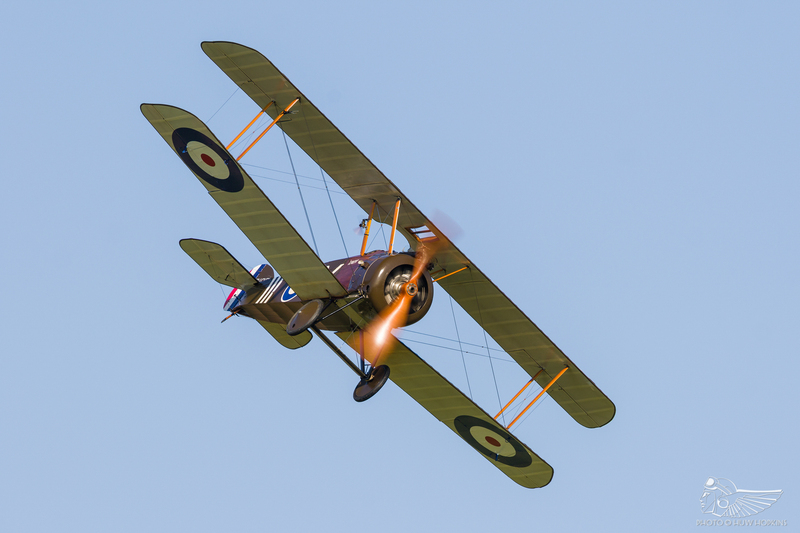 The Triplane was armed with a single Vickers gun and although well respected by the opposition and loved by its pilots there were some concerns over its structural integrity when diving. 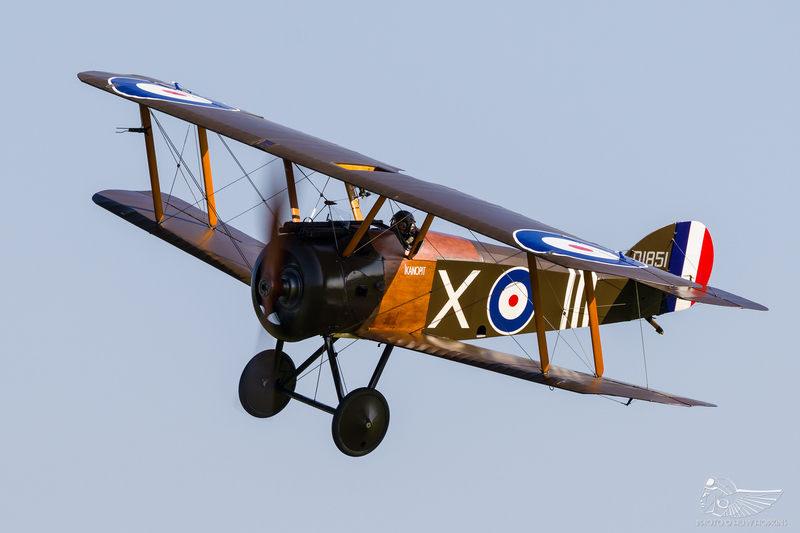 Clearly a more robust, more heavily armed and more powerful aircraft was required and what emerged was the legendary Sopwith Camel. For reasons which now seem difficult to fathom the locations of the fuel tanks and the pilot were reversed in the Camel when compared to its predecessors. 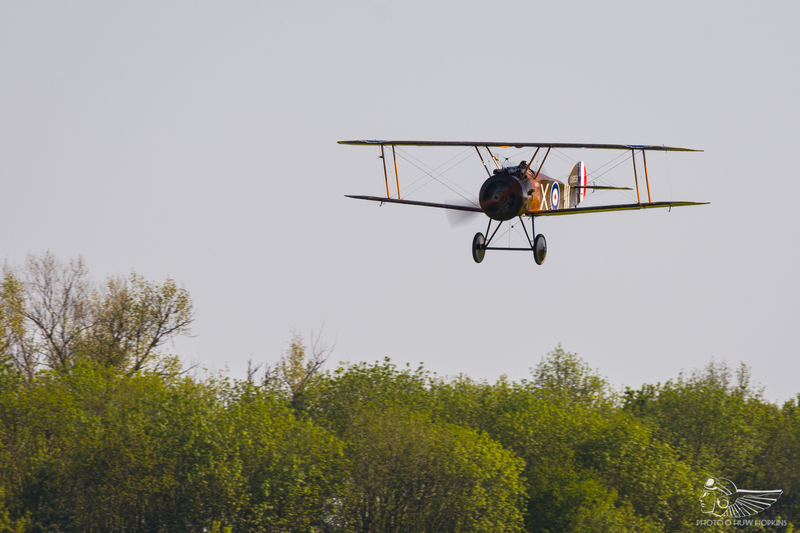 In the case of the Pup and Triplane the fuel tank was located at, or close to, the centre of gravity (cg) with the pilot sitting to the rear and behind the top wing; thus fuel consumption did not alter the position of the cg. In the Camel the pilot sits under the top wing, which restricts his field of view, while the fuel tanks are located to his rear and therefore well behind the cg. This means that with full fuel tanks the cg is at the aft limit of 13 inches aft of datum (AoD), or about 34% of the Standard Mean Chord (SMC), and when all fuel is consumed the cg has migrated to the forward limit of 8.8 inches aft of datum or 27% SMC. The longitudinal stability of an aircraft is a function of the cg position, the further aft the cg the smaller the static and manoeuvre margins and all the associated longitudinal handling characteristics such as trim, stability, and control are thus affected. With the cg forward the stability increases but as fuel is consumed controllability reduces, sometimes making it impossible to make a proper three point landing. So, in one flight, the character of the Camel will change from one extreme to the other. The Camel also differed in layout in that the surface areas of the fin, rudder, tailplane and elevator were all smaller when compared to the Pup/Triplane and the fuselage was slightly shorter, further reducing the effectiveness of the tail as a stabiliser and, importantly, as a rate damper (see footnote 1). Looking into these changes in a bit more detail; tail volume is a measure of the effectiveness of the horizontal tail, and fin volume is the equivalent for the vertical surfaces (see footnote 2). These parameters are non-dimensionalised by standard factors so that different aircraft can be compared directly. If this is done with the Sopwith stable, and taking the Pup as the reference aeroplane, we find that the 1½ Strutter and the Triplane have equivalent fin volumes and greater tail volumes, whereas the Camel has about 75% of the tail volume and 85% of the fin volume of the Pup. This indicates that both the longitudinal and directional static stability of the Camel will likely be lower than those of the Pup and the Triplane. Add to this formula an engine with 75% more power than the Pup and things are never going to be quite the same again. Indeed, these various configuration changes transformed what was considered to be a ‘delightful’ aircraft to fly (at least by the standards of the day) into a machine of which Norman MacMillan, an experienced Camel pilot, said, “Here was a buzzing hornet, a wild thing, burning the air like raw spirit burns the throat”. So it was not without some circumspection that I approached the first flight of our Camel. This machine was the last product of The Northern Aeroplane Workshops and followed their outstanding reproductions of Sopwith Triplane ‘Dixie’ and the Bristol M.Ic. As with all such projects I tried to prepare myself appropriately and while usually I have to go digging for data, in this case I was deluged with information from all-comers who had my best interests at heart. When the assembled data filled a box file I thought we must be about ready. The aircraft had been weighed, the cg established and referenced to the SMC. The engine had had several successful ground runs and I had tried a brief taxy session. By the time I flew the Camel I had flown the Pup and the Triplane a number of times and had had one particularly valuable trip in the TVAL Sopwith Snipe. The aforementioned Norman MacMillan had written a very informative article for Aeroplane Monthly in 1984 and former RNAS pilot Ronald Sykes published his Camel notes in Flight International in 1968 – these articles served as my ‘Pilot’s Notes’. I also received valuable pointers from Bob Richardson, Stuart Goldspink and Gene DeMarco. In a rotary engine the gyroscopic precession (see footnote 3) of the engine/propeller cross couples yaw rate to pitch rate and vice versa such that a pitch up causes a right yaw and the magnitude of these effects is proportional to engine RPM, and inversely proportional to tail and fin volume and airspeed.  Therefore, for a given aircraft configuration, the worst condition is likely to be high power and low airspeed as experienced on take-off and climb. I planned to mitigate these effects by applying power slowly during the take-off, by climbing at a somewhat higher than optimum speed and by avoiding the need for climbing right turns until experience was gained. In addition, the aircraft was equipped with a modern slip ball style indicator which is more intuitive to ‘modern’ pilots than the more contemporary inclinometer (or lateral bubble). It had been noticed during the ground runs that the Rotherham air pump did not spin in the propwash with the aircraft stationary so it was not known whether it would be capable of maintaining fuel tank air pressure with the additional ‘wind’ available when in flight. There was therefore a risk that once the take-off was commenced the pressure would fall, and with it engine power, before the pilot had the height and spare capacity to diagnose the cause and rectify it. To mitigate this the ground crew were asked to give me a ‘pump-up’ signal immediately before commencement of the take-off roll to maximise the time before the pressure fell should the Rotherham fail to do its job. It is not unusual to find that on the first flight of an aircraft the airspeed indicator either fails to work at all or has such large errors as to be useless. To mitigate this possibility I had ready a phone app displaying GPS speed in a conventional round-dial format graduated in the relevant units. 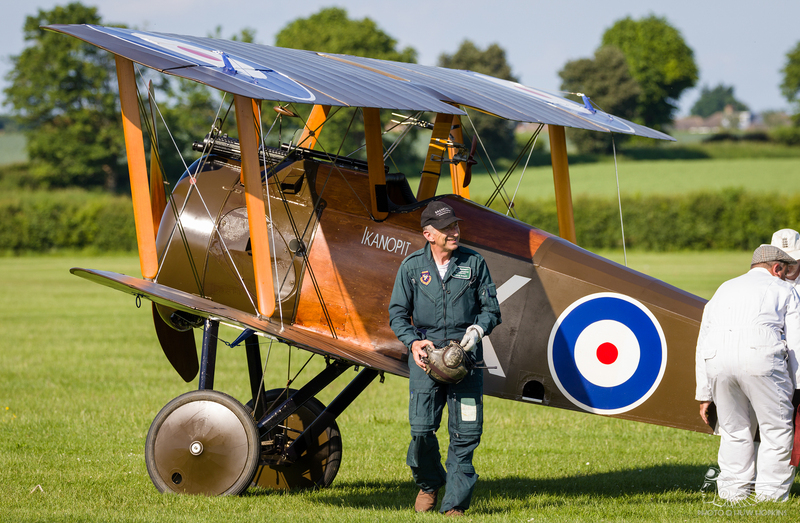 The first flight of Sopwith Camel G-BZSC was undertaken at Old Warden on 18 May 2017. The take-off weight was 1,440 lb with the cg at 11.28 in AoD (31.7% SMC). The conditions preferred for first flight were a light wind aligned with the main runway and the absence of thermal activity and stronger winds aloft which could significantly alter the wind velocity episodically. On this day, the 1,000 ft wind was forecast to be 290/05 and the surface wind was more or less calm. The take-off direction chosen was 21 so as to provide a forced landing option on the rugby pitches because crops in the fields beyond the 03 end had grown to a significant degree. The aircraft is fitted with a long stroke Clerget which is reputed to produce 140 HP but has a limitation that full throttle should not be used at sea level. Engine ground runs had established that 1200 RPM was readily achievable with part throttle. During the pre-takeoff run-up the settings for 1100 RPM (considered adequate for the first take-off) were bloctube (BT) 6-7 and fine adjustment (FA) 3½ – 4½ (see footnote 4). Running on a single magneto was checked and although the engine note changed there was no discernible RPM drop. The engine was throttled back to 600 RPM (BT = 2) and chocks waved away. Fuel air pressure was pumped to 2 – 2½ psi. The stick which had been held back during the run-up was repositioned to approximately half way between neutral and full forward. The BT was opened slowly to ensure that the engine was responding correctly without choking and to mitigate the gyroscopics as discussed earlier. As expected the tail did not lift until about half way through the take-off roll and when it did lift the aircraft yawed slightly to the left before I was able to detect and correct the movement. Although some pitch sensitivity was noticed it was possible to maintain the correct pitch attitude. The aircraft bounced off a runway designator marking, skipped once and climbed away. The BT had reached about 5 by the time of lift off and was advanced to 6 once clear of the ground. The FA was left as set. There was as expected a modest push force needed to maintain the desired pitch attitude. The aircraft appeared to be climbing well and the track was adjusted slightly to the right so as to maximise the space for a climbing left turn through 180 degrees on reaching the rugby pitches. This left turn was made with approximately 15 degrees of bank but even so it was not straightforward to maintain the aircraft in balanced flight. Once the turn was complete I checked the ASI and the air pressure – the ASI was showing 90 mph which agreed with the GPS back-up; the air pressure was maintaining 2½ psi and the Rotherham appeared to be spinning rapidly. The climb was continued overhead the airfield to 3,000 ft (the altimeter reading appeared plausible). Various turns were essayed during the climb and in either direction it was difficult to keep the aircraft in balance. It was noted that the lateral bubble appeared to have sprung a leak and that the positioning of the conventional slip ball was such that the ball itself (if centred) was completely obscured by the altimeter setting knob. A few minutes later the tube from within the lateral bubble slipped out and fell to the cockpit floor! The friction device on the engine control quadrant allowed the BT lever to retard itself if not restrained by the pilot. At the top of the climb power was reduced somewhat and it was found to be significantly easier to maintain balance in turns at the reduced power setting. With power set for approximately 600 RPM the aircraft was brought to the stall. The stall itself was benign and full back stick could be reached. The stalling speed was between 35 and 40 mph indicated, which is plausible. A brief assessment of the lateral and directional static stability was carried out using steady heading sideslips. The aircraft behaved differently between left and right sideslip tests and this is an area which will needed further investigation on subsequent flights. During later flights it transpired that the aircraft has pretty low directional stability and what stability there is, is masked by the engine effects. The descent was made with the BT set to 2 – RPM iro 6-700. During the descent engine response in a simulated go-around was assessed and was satisfactory. At descent power the fuel tank air pressure was not maintained. I had to augment the pressure with the handpump on several occasions. The approach was made from a left hand circuit to runway 21. The target approach speed was 60 mph. On base leg at about 200 ft agl the BT was advanced to 3 and the blip switch used to reduce power. A modest (right rudder) sideslip was used without difficulty. The approach was planned to achieve a touchdown well into the airfield in case the glide characteristics were disappointing. The precession effects noted at high power were not intrusive in the glide. Once again it was necessary to use the handpump to restore fuel tank air pressure in the event of a missed landing. Once close to the ground the aircraft was levelled and held off while it slowed down. This was not hard to do. Earlier research suggested that the optimum Camel landing is achieved by holding off until the aircraft will fly no more and then as it sinks onto the surface full back stick is applied. This is more or less the technique I used and a near three point touchdown was achieved. There was a small bounce but the attitude remained steady and the aircraft landed again and ran straight. During the landing roll-out the power levers were adjusted to BT=2 and FA=2 and it was possible to throttle the engine as required to taxy clear of the runway. Once stopped the engine was idling very slowly but seemed slightly rough which was diagnosed as over-richness. The BT was retarded slightly and after 30 seconds the engine began to ‘fizz-up’ as the richness cleared. The engine was then shut down by setting the FA to zero and opening the BT as it ran down. The fuel selector and magnetos were then turned off. Since that first flight there were three more to cover off the various test requirements. We had some difficulty solving the fuel tank pressurisation issue but a change of Rotherham pump seems to be the answer. I have found that if the conditions are somewhat bumpy then flight at higher airspeeds requires considerable pilot compensation to maintain steady balanced flight. While such pitch sensitivity was to be expected I had not anticipated that the aircraft would be quite so capricious in the directional sense – due I imagine to the combination of the engine gyroscopics and the low fin volume. These effects can be somewhat ameliorated by restricting power to around 1100 RPM and airspeed below 100 mph or so but that is sufficient for display purposes. 1. The fin and tailplane keep the aircraft pointing in the direction of the airflow ie stabilise it. If that situation is disturbed they damp out any resulting oscillation in a more or less effective way. 2. The effectiveness of the tailplane and fin is not only affected by their area but also, among other things, by the wingspan and distance from the cg. You can find more details at: http://www.eaa62.org/technotes/tail.htm. 3. In a rotary engine the cylinders spin on the crankshaft and act as a big gyroscope that wants to keep working in the same plane, a characteristic known as rigidity. The other characteristic of a gyroscope, precession, is the effect where, when a force (or torque) is applied to the gyroscope, it is felt transposed 90 degrees in the direction of rotation. Hence, with the engine rotating clockwise when viewed from the cockpit, if the aircraft pitches up that is like pushing a stick into the gyro at the six o’clock position, this will move around through 90 degrees and the result will be as if the stick was pushed in at the nine o’clock position and this will cause the aircraft to yaw to the right. 4. The Clerget rotary has a primitive bloctube carburettor which is controlled by the bloctube lever (analogous to a throttle) and a Tampier (or fine adjustment) which is analogous to a mixture control. Unlike more sophisticated modern engines both controls must be manipulated appropriately to obtain the power required. This article first appeared in the Shuttleworth Veteran Aeroplane Society’s excellent Propswing magazine. 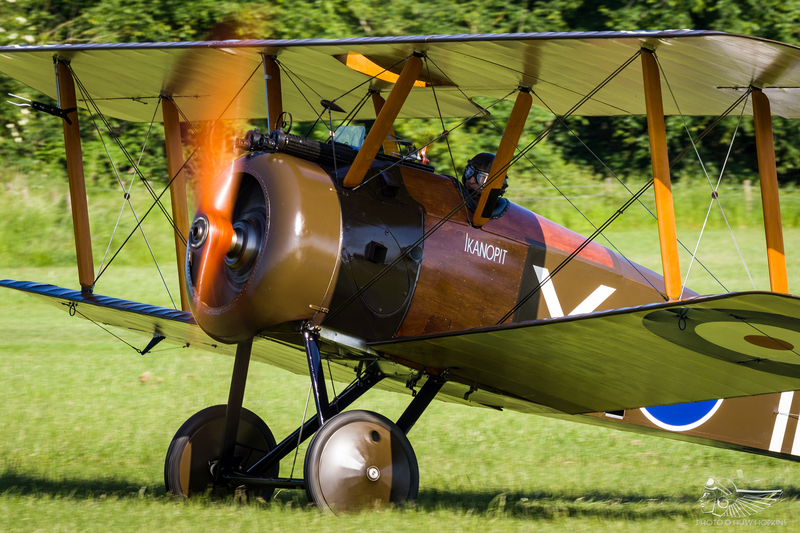 The VAE would like to thank The Shuttleworth Collection and the Shuttleworth Veteran Aeroplane Society for kindly giving their permission for the reproduction of this article.